Yellow jackets are related to bees but are different in more ways than not. They each both belong to an order of insects known as Hymenoptera (meaning “membranous wings”) which also includes wasps and hornets. For the purposes of sting treatment, the biggest difference between yellow jackets and bees is that yellow jackets can sting multiple times. In fact, they have a reputation for being aggressive, especially among gardeners. You can distinguish yellow jackets by their smooth, slim appearance and long, dark wings. Though bees can also have yellow and black markings, they are usually stout and hairy with light-colored wings. Yellow jackets are also meat-eating predators, while bees get nourishment from flower nectar. When a yellow jacket stings you, its stinger pierces your skin and injects a venom that causes sudden and often extreme pain. You may also develop redness and swelling around the site of the sting a few hours later. Unlike a bee sting, a yellow jacket will not leave its stinger behind once you've been stung. As such, you won't need to pull out the stinger as you might with a bee. Wash the sting site with soap and water. Apply a cold pack to the sting to reduce the pain. To avoid frostbite, place a cloth barrier between your skin and the ice pack. Keep the pack moving, and avoid icing the skin for more than 20 minutes. Apply a topical antihistamine or calamine lotion to the skin. Some people also recommend applying a homemade paste made of baking soda and water. If needed, take an over-the-counter oral antihistamine like Benadryl (diphenhydramine) to relieve mild itching and swelling. Avoid driving or using heavy machinery as the drug may cause drowsiness. A number of home remedies can be also found online. While most have scant evidence to support their use, some people strongly believe in them. They include white vinegar (which is believed to neutralize yellow jacket venom when dabbed onto the skin) and commercial meat tenderizer (which contains an enzyme called papain thought to break down venom proteins). Papain is also found naturally in papaya, the skin or mashed fruit of which may be applied to the skin as a poultice. Systemic allergic reactions to insect stings affect up to five percent of the population during their lifetime, according to a study published in the Journal of Asthma and Allergy. Some insect stings can cause a potentially life-threatening allergy known as anaphylaxis. This tends to occur more with honeybees than yellow jackets since their stinging mechanism can remain embedded in the skin and continue to pump up to 140 micrograms (mcg) of venom. Overall, roughly three of every 100 people stung by an insect will experience anaphylaxis, according to research from the John Hopkins Asthma and Allergy Center. If left untreated, anaphylaxis can lead to shock, unconsciousness, coma, asphyxiation, cardiac or respiratory failure, and death. Anaphylaxis to an insect sting can develop at a terrifyingly rapid pace, with symptoms often appearing within five to 10 minutes. Delay reactions, also known as biphasic anaphylaxis, are more common with food and drugs than insect stings. Call 911 or seek emergency care if you experience symptoms of anaphylaxis following a yellow jacket sting. If you have a history of anaphylaxis or experienced a severe reaction to an insect sting in the past, you may be advised to carry an epinephrine auto-injector, also known as an EpiPen, in the event of an emergency. The EpiPen is usually injected into the middle part of the outer thigh and delivers a dose a epinephrine (adrenaline) to help counteract some of the major symptoms. Anaphylaxis always requires emergency medical treatment even if an EpiPen has been used. In some cases, you may be monitored for three to six hours and released if your symptoms resolve. Serious cases may require overnight hospitalization and the administration of intravenous antihistamine, corticosteroids, and fluids to counteract the whole-body reaction. The best way to prevent a yellow jacket sting is to avoid anything that can draw them near you. Yellow jackets are predators and carrion scavengers that are readily attracted by sugars and proteins in picnic foods. 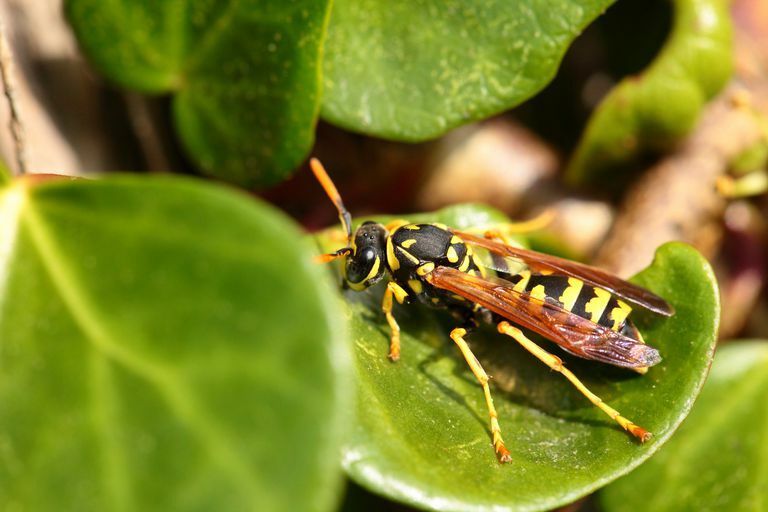 If you eating outdoors and find yourself surrounded by yellow jackets, it may be better to leave than to use insecticides or smoke them out with your barbecue. Yellow jackets are naturally aggressive and will only get more aggressive if you try to shoo them away. If provoked, they will make a point of trying to sting you. Moreover, they will release chemicals into the air known as pheromones to call other yellow jackets to join them in an attack. If you are at risk of anaphylaxis, you want to ask your doctor for a referral to an allergist for immunotherapy treatments (also known as allergy shots). The aim of the immunotherapy is to desensitize you to the insect venom by introducing tiny amounts into your body at regular intervals. If successful, immunotherapy may prevent help anaphylaxis, although it may not erase all of your allergy symptoms. Golden, D. Insect Sting Anaphylaxis. Immunol Allergy Clinic N Amer. 2007;27(2):261–vii. DOI: 10.1016/j.iac.2007.03.008. Ludman, S. and Boyle, R. Stinging insect allergy: current perspectives on venom immunotherapy. J Asthma Allergy. 2015;8:75-86. DOI: 10.2147/JAA.S62288. Przybilla, B. and Ruëff, F. Insect Stings: Clinical Features and Management. Deutsches Ärzteblatt Int. 2012;109(13):238-48. DOI: 10.3238/arztebl.2012.0238. Will Urine Relieve the Pain of Jellyfish Stings?